I used to be one of those extreme coupon people, only not nearly as extreme as the ones on TV. One day I realized that I was getting great bargains and that made me happy. However, I was getting great bargains on things I didn’t really need or want. I was coming home with lots of granola bars and paper towels, but not much that I could make a good dinner with. Also, a lot of the bargains were for unhealthy foods like cookies and fruit gummies. I’m not against unhealthy foods. I generally cook with love, rather than low fat or non-fat ingredients. But in my couponing days, in the name of a good deal, most of the things that came home with me were sugary snacks that most people would not feed their families for dinner. 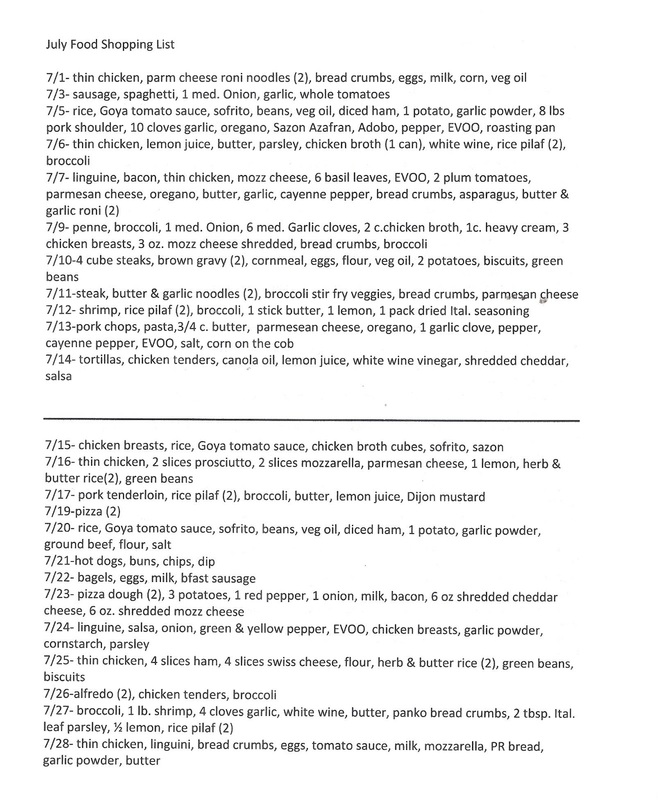 So, I decided to stop the coupon craze, and I started meal planning instead. It sounds simple, and now that I’ve been doing it for years, it is simple. But it was harder in the beginning than I thought it would be. Keep reading to see how my “system” came to be. I started by pre-planning meals by the month. 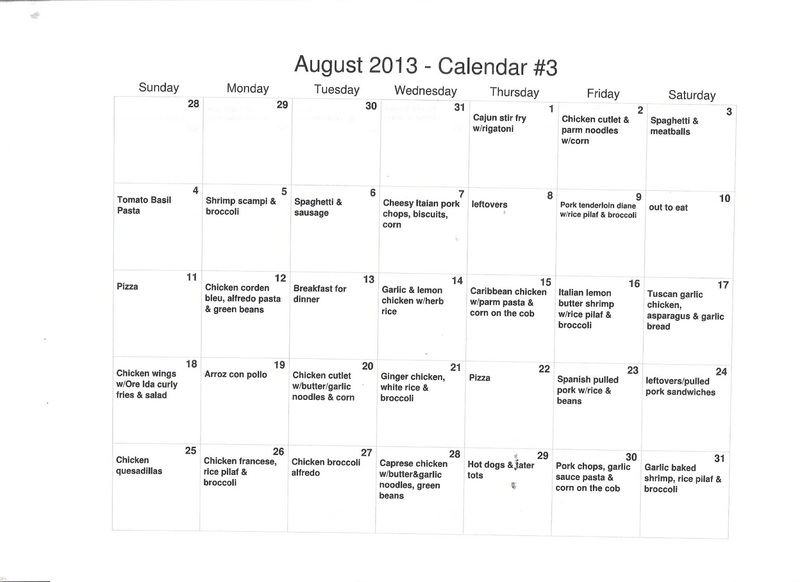 So, for instance, below is an example of next month’s calendar with the meals I am planning on cooking for dinner. 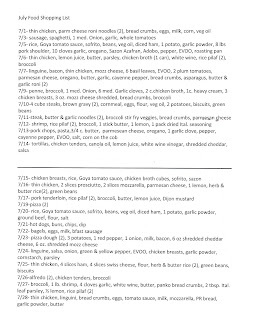 Also pictured below is the food list I print out for grocery shopping (I included July’s food list because I haven’t completed August yet). I split the food shopping list in half based on when I receive my paychecks. So, I grocery shop for the top half of the sheet with my end of the month check, and I grocery shop for the bottom half with my middle of the month check. Because I already know what I am cooking, grocery shopping becomes very simple. I only buy what I need to make the meals that I’ve planned, as well as any necessities such as milk, toothpaste or juice. And yes, sticking to the list in the beginning was difficult. But my food bill literally shrunk in half (and I didn’t use coupons), so it was worth the effort that meal planning requires. It is okay to repeat meals more than once a month. I repeat vegetables a lot because my children will only eat a few different types of veggies. However, I challenge myself to try not to repeat too much in one month’s time because I like variety and I think it’s good for my children to eat different things. If you have kids, plan the meals based on your schedules. If your kids are into sports or clubs, time is probably crucial during the week, so I would suggest planning the quickest meals for your busiest days. Meal planning doesn’t always work out. Some days, we have way too much food leftover, so we have spontaneous “leftover” days. Or sometimes, we decide to go out to eat. So, plans change and it’s okay. 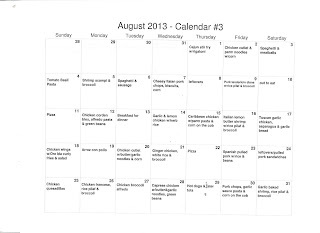 When this happens, I just shuffle the meals around to the next day, week or even to the next month. Don’t stop experimenting. Once I had enough food to fill a month without any repeats, I stopped looking for new recipes. Big mistake! Keep looking for foods that interest you and your family! So, that’s my meal planning system in a nutshell! Happy planning!